1954 - Marilyn Bell was the first person to swim across Lake Ontario. 1956 - Lester Pearson, Canada's Secretary of State for External Affairs, put forward the idea of mounting the first United Nations peacekeeping force to help settle the Suez Crisis. He won a Nobel Peace Prize for his initiative. 1957 - Under the government of Louis St. Laurent, a national health care act was passed. The Hospital Insurance and Diagnostic Services Act gave federal money to provinces who wanted to set up public, universal health insurance programmes. 1957 - Sputnik, the first space satellite, was launched on October 4th by the Soviet Union beginning the race for space between the U.S.S.R. and the United States which was part of the Cold War. It continued to orbit for three months, providing important information about space science, before falling and burning on re-entry on January 4th, 1958. 1957 - Ellen Fairclough was the first woman to be appointed as a federal cabinet minister. Progressive Conservative Prime Minister John Diefenbaker appointed her as Secretary of State for Canada after he won the 1957 election. Though it was a minority government, this was the first time the Conservatives had formed government since R.B. Bennett's brief reign from 1930-35. In 1958, Fairclough was appointed Minister of Citizenship and Immigration and later she became Postmaster General. It was Fairclough who nominated Kim Campbell for the leadership of the PCs in 1993. Campbell won, succeeding Brian Mulroney, and became the first woman Prime Minister of Canada. 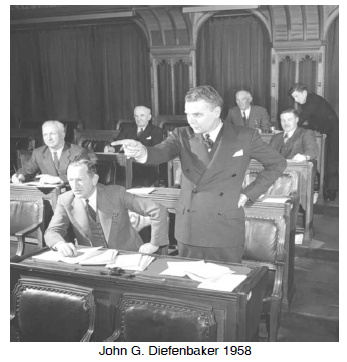 1958 - Prime Minister, John Diefenbaker, dubbed "Dief the Chief," called a snap election and won a landslide victory, taking 208 of the 265 seats in the House of Commons. This was the largest majority in Canadian history at that time. 1958 - The Avro Arrow first flew on March 25, 1958. Designed and built in Canada, the Arrow was the fastest jet interceptor in the world. Powered by two Orenda engines developed and manufactured in Canada, the Arrow could fly up to 2415 kilometres per hour. Six Arrows were built before Diefenbaker's government stopped their production in 1959. Some Canadians felt that resistence from American buyers had helped to kill the Arrow. Supply of arms was, and still is, a large part of the U.S. economy. When the Arrow died, 13,800 people lost their jobs at A.V. Roe Canada Ltd. Some of its engineers went to the U.S. where they helped NASA put a man on the moon.